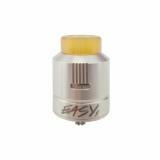 AFK Studio Easy One EDA RDA, which has 2ml capacity, adopts suhohm coil to let beginners taste high-level falvor. Take it to have a perfect vaping experience. AFK Studio Easy One EDA RDA, which comes with 2ml capacity to meet your daily needs, doesn't need to use the coil making tools to make it. You will replace coil easily within 3 seconds, however, pure flavor will be delivered to you. The aim of this item is that let beginners taste high-level flavor without difficulties of building. Take it to share with your friends. 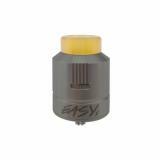 • Quick link: Studio Easy One EDA Atomizer Coil. Nice flavor, it is more on the sweeter side I would say. With this RDA my liquids taste sweeter than with other atomizers. The air flow control is amazing, very quiet and smooth. The build deck is not that great, it's difficult to build a dual coil deck with only two screws. The air flow control has an option for single coil where one side is completely closed, I haven't tried it jet but than the build would be much easier. The Easy One EDA RDA was designed for maximizing flavor and vapor production in an easy to build design for anyone looking for a smooth and stylish rebuildable atomizer. AFK Studio Easy One EDA RDA is 24mm Easy Dripping Atomizer which comes with replaceable deck with coils and wicks, making it convenient to use without any building. The 0.15ohm finished atomizer coil can be. Wth a 2ml capcity tube.